I received a bottle of Postmark Brewing Raspberry Fruit Beer with my Canada Craft Club July 2016 package. For some reason I took the picture, made all of my tasting notes but finish the write-up ... that is 'til now. 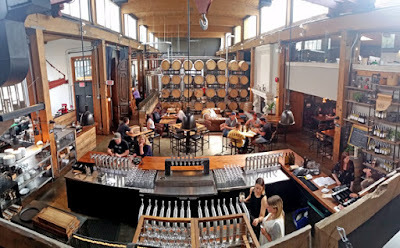 Postmark Brewing opened its doors in June 2014. The company's website shows its sponsorship of film festivals and music and there is a reason for that. The brewmaster, Craig Noble, has always loved craft beer but his main profession before opening the brewery was as a documentary film maker. At Postmark Brewing we are inspired by more than just great tasting sessionable craft beers, we enjoy taking a collaborative approach towards our other passions in life including music, photography, travel, sport, design, events and especially those who are taking risks and making great things happen. This Raspberry Fruit Beer pours a light amber colour with a slight reddish tinge. I really noticed the raspberries which dominates the aroma. I was wondering if this would be overly sweet but need not have been concerned. My first sip starts off a little tart and then the enjoyable raspberries come flooding through. The raspberries taste then falls off in the finish which is again tart. One surprising thing is that as I was typing that last paragraph, I had the sensation of fresh raspberry, like I had a piece of one in my teeth. There are no pieces of raspberries anywhere in this but that taste was the same as when I'm at work and have just finished one of Teena's delicious freshly made fruit salads. I didn't expect complexity in a fruit beer but found one here. Delicious and refreshing, especially on a hot afternoon when I had it (tasting notes written on July 23, 2016). I had ordered some more of these from Canada Craft Club (they all were delicious! ).